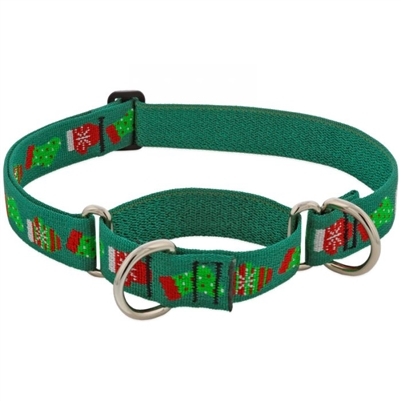 LupinePet Holiday Designs Martingale Collar is perfect for leash walking and training in holiday style. Our Martingale collars are a limited slip collar designed to offer more control without choking. With a proper fit, the martingale design prevents your dog from backing out. Safety, control and comfort in one easy tool! Slip on and adjust to a cofortable fit. Additional D-ring provides a place for tags or, clip to both D-rings to use without the martingale feature.